My blog is focused primarily on Cote d’Azur, but when people visit the area and drive through Nice, they may see those big yellow boats heading into and out of its old port – a docking area off-limits to cruise ships. These are the car ferries going to and from Corsica, a beautiful island and natural extension of a visit to Cote d’Azur. It is not, however, a one or two day trip – and really deserves at least a week – but it can be seen by car in five days. My wife and I have made the trip three times – once to get a quick overview; a second to see what we had missed; and a third time with friends. We loved our second trip that focused on the gorgeous west coast, but for those going for the first time with a limited schedule, Corsica can provide for a broad-based, enjoyable visit that touches on all four Corsicas in just five days. The Corsica ferries are headed mostly to Bastia and Ajaccio, and for that “see it all” trip, I recommend Bastia. 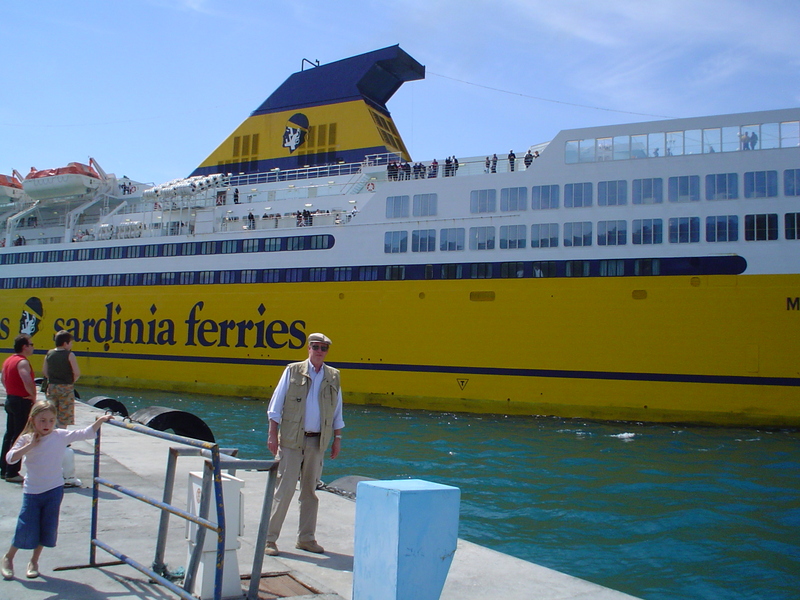 Its timing is perfect as one of the Bastia ferries leaves Nice at 2:15 PM and arrives in Bastia around 7:30 PM. This provides for a relaxing five hour boat ride and gets you to Bastia in time for a port-side dinner. There are several good hotels in Bastia, but our preference is a convenient Best Western above the town center. From there, it an easy, albeit not particularly scenic, two hour drive south to Porto-Vecchio and Bonifacio. The latter is the “must see” place in Corsica, but stopping at Porto-Vecchio for lunch is a nice introduction to this part of the island. The town has no real historic significance, but it has restaurants overlooking a beautiful harbor filled with pleasure boats – and is less than 30 minutes from Bonifacio. Bonifacio is one of the hidden gems of Mediterranean that will not easily be forgotten. The town dates back to Roman times, but it gained its prominence in the 9th century when the Tuscans took it from the Saracens and put a fortress on the high cliffs that look across the sea to nearby Sardinia. Your first exposure, though, will not be the old town on the cliff, but the new town by the water where the hotels and restaurants are located. 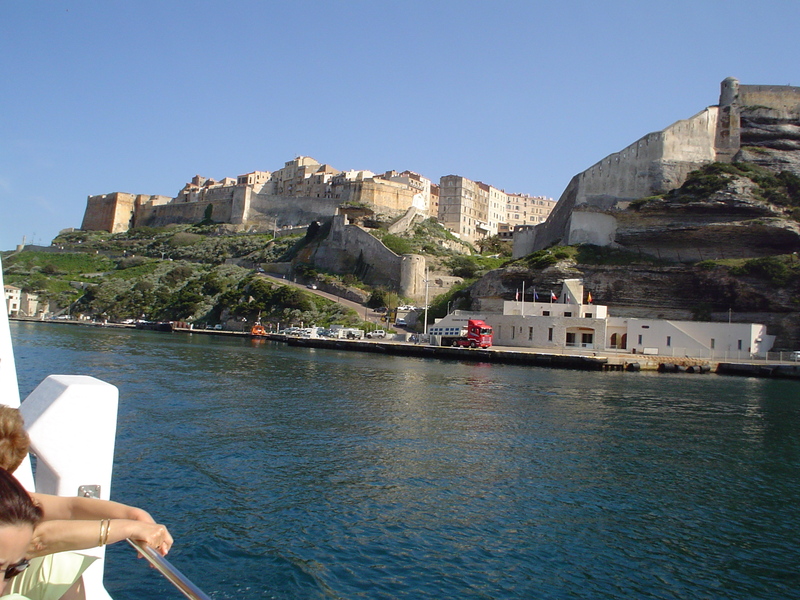 After you check into your hotel – and our favorite is the Hotel La Caravel with its easy parking and waterfront location – the best way to start your visit to is to get into one of the tour boats in front of the hotel and see Bonifacio from the sea high above you on the cliffs. This is what has been seen by visitors for centuries as they came by boat, not car – and this is the Bonafacio you will most remember. When the short boat trip is over, it is time to climb up to the old town and wander around and take pictures. One can dine up there as well, but most visitors end up back in the new town at one of the many water side restaurants. 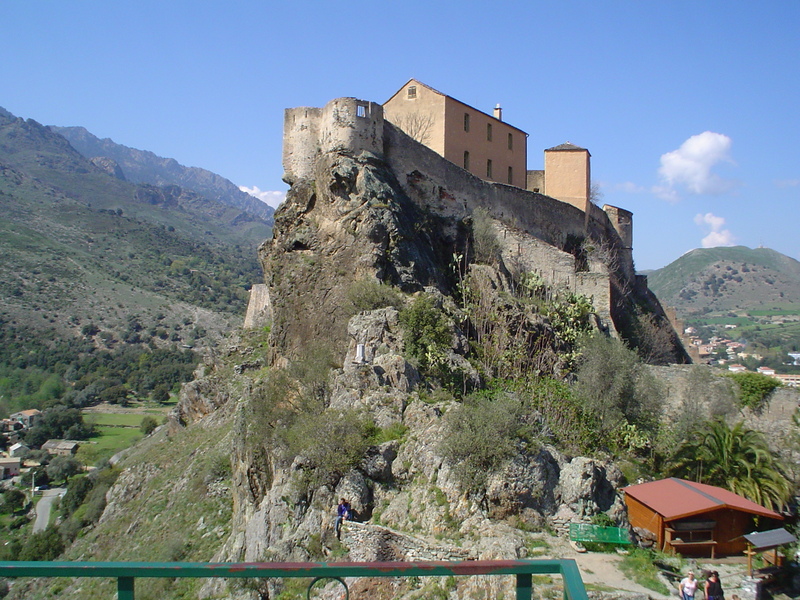 Then it is 0ff to the mountains, and the best way to do this is to head north toward Bastia, and at the town of Ghisonacchia making a left turn on the road to Corte. You will then soon be seeing mountain scenery that matches the best of Switzerland as Corsica is not called the “Ile de Beaute” for nothing. Near the intersection with the road from Ajaccio to Corte there is an excellent roadside restaurant, Le Chalet, and then on to Corte for an overnight stay. Corte is Corsica’s capital, a hiker’s paradise and sits in shadow of citadel 300 feet above the town that is open to visitors. To the left of the citadel is a popular “look-out” that is aptly called the Belvedere that provides a wonderful panorama of the area. The history of Corsica is very much tied to Italy, and this is particularly evident in in Corte’s town squares that have names such as Paoli and Gaffori. The hotels and restaurants are near these squares that are connected by the Cours Paoli and frequently have entrances on the second floor. We have stayed in Corte twice and enjoyed both the Hotel du Nord and Hotel Duc de Padoue. If time is limited, one can visit some of the small mountain villages near Corte and then head back to Bastia for a last night and catch the 8 AM boat to Nice. An extra day going west to the popular port town of Calvi, though, is well worth the time. 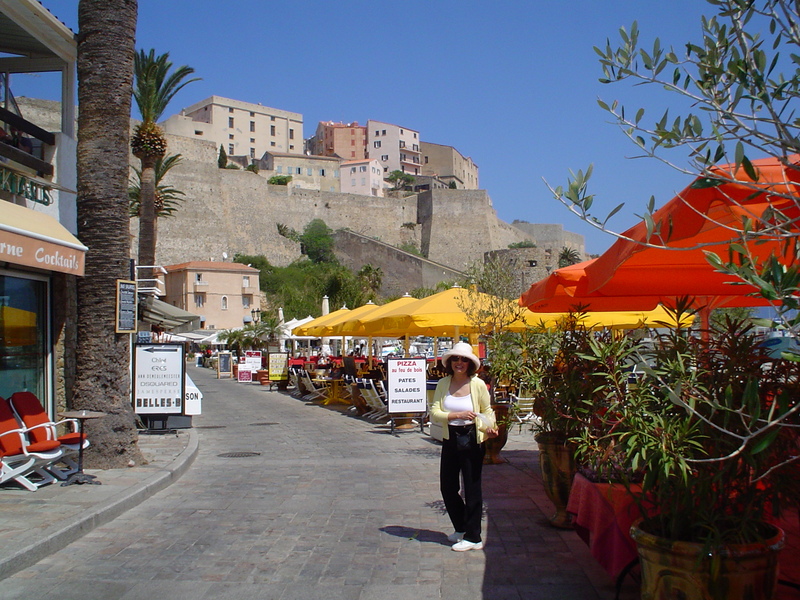 Calvi has a citadel as well, but this time it overlooks the water instead of mountain valleys – and is a busy tourist center with beaches and seaside restaurants reminiscent of Cote d’Azur. There are numerous hotels, and we were quite happy with our choice, Hotel Saint Christophe, but there were several with higher TripAdvisor ratings. 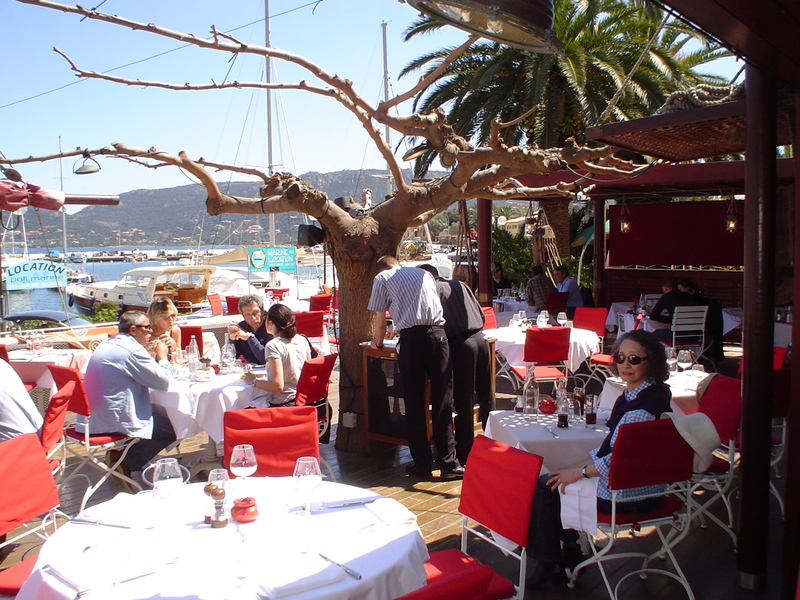 Beachside restaurant in front of Calvi’s citiadel. From Calvi it is not too far a drive to Bastia to get the boat back to Nice, which allows time to meander along the scenic shore road north and have lunch in another of Corsica’s charming west coast resort towns, St.-Florent. This entry was posted in Corsica and tagged Bonifacio, Calvi, Corte. Bookmark the permalink.